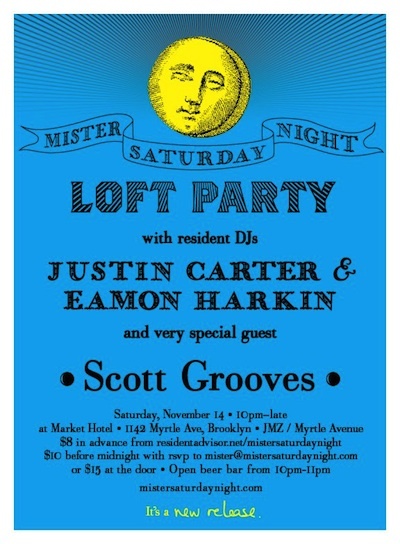 Mister Saturday Night has got a nice, new, cozy home at the Market Hotel loft. After our early October party with Dixon (check the photos out here courtesy of Marc Whalen), it was clear the right balance had been struck. The space is great: plenty of room to spread out, dance and chat; room for our booming soundsystem (which is now twice the size… 10,000 watts of Turbosound for all you sound nerds out there); and easy access from the train (the JMZ is just out the door, and we see it whizzing by the window all night). Eamon Harkin and Justin Carter will be dropping their disco, house and other sundries just like you like, and our special guest is Scott Grooves. It’s hard to believe it, but Scott, a Detroit DJ considered one of the best by Omar S, and a producer who’s worked with George Clinton and Roy Ayers, has never played in New York City. Word on the streets of the D is that we’re all in for a treat. Also, we’re starting off the evening with a little present. Beer is on the house from 10p to 11p, while we play some jams to get you started. We’ll see you then and there.